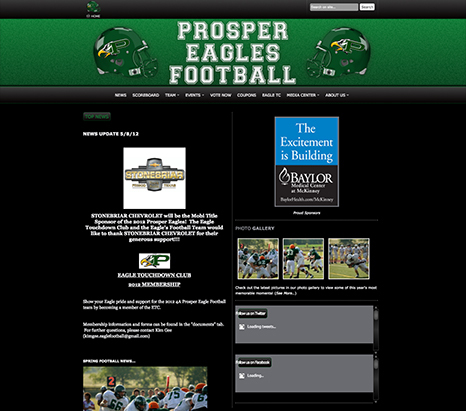 What: High school football program located in far north-Dallas suburbs. 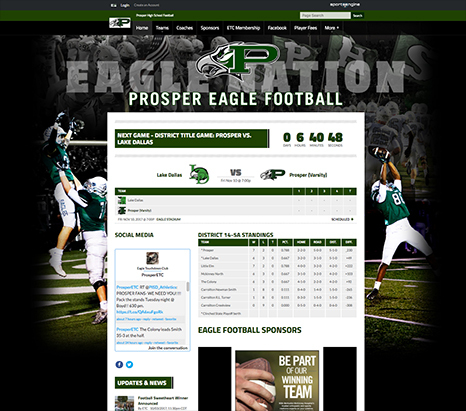 Goal: Move to a platform that provides a website that is easier to update, is mobile responsive and has a dedicated prospereaglefootball.com URL (the previous website's URL included the name of the platform provider). Making it happen: Webmaster Matt Nelson is good friends with the previous Prosper Eagles Football webmaster and had experience using the SportsEngine platform for other organizations as a team manager. He's put his stamp on the organization by using a wide array of page elements on the home page and setting up a page for the program's sponsors. He also manages a registration that allows fans to join the Eagle Touchdown Club and buy season tickets. "What I love is how easy it is to update the site," Nelson said. "I'll hear, 'Hey we need to remove this, we need to add this.' It is so easy to be able to make those changes." What SportsEngine has given us is a better way to organize our information."